Optimum Nutrition's Gold Standard series is one of the best known ranges of any brand on the market and includes products such as Gold Standard 100% Whey and Gold Standard 100% Casein. Most recently, Optimum have decided to expand their entire line of Gold Standard supplements. 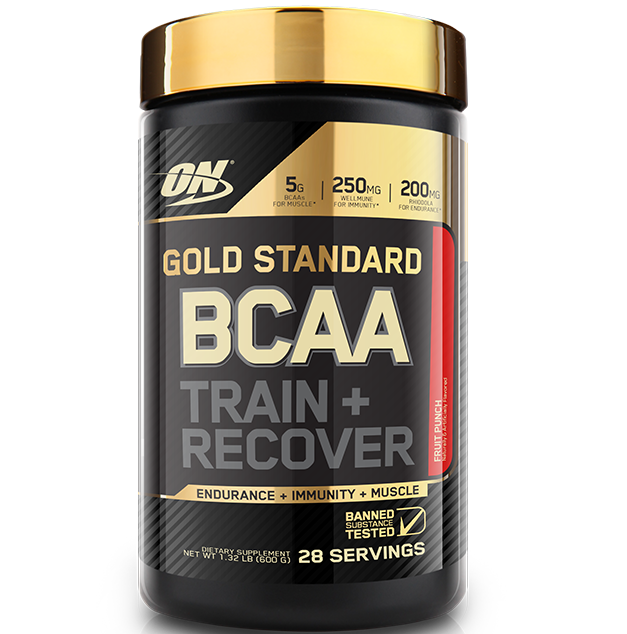 One of the latest inclusions is the new recovery and intra workout support formula known as Optimum Nutrition Gold Standard BCAA Train + Recover. Aside from that, there’s a couple of minerals/electrolytes in the form of magnesium, sodium and potassium. Each tub of 280g contains 28 serves of 10g each. BCAA or branched chain amino acid supplements are incredibly handy for those seasoned trainers looking for that extra edge when it comes to muscle building and recovery. BCAAs, especially leucine is well known for its ability to kick start muscle building processes. That is, it helps to boost the process of muscle protein synthesis and thereby shifts processes in the body from catabolism (muscle breakdown) to anabolism (muscle building). For those who are taking enough protein, but still find that their muscle building or recovery processes are a bit lacking, then a good branched chain amino acid supplement can definitely help. There aren’t a whole lot of negatives about the new Optimum Gold Standard BCAA. It’s well dosed in all three key active ingredients. The only minor complaint is the proportion of active ingredients to flavours and mixing agents, which take up roughly 4.5g of a possible 10g serve. Since it’s such a simple formula, there’s really not much to fault though. The Gold Standard BCAA is available in four flavours including: Fruit Punch, Cranberry Lemonade, Strawberry Kiwi and Watermelon. It’s a strong, fruity flavour of moderate sweetness and should please the majority of its fans. It’s extremely smooth and less gritty than previous versions of other BCAA formulas in their arsenal. While there is some slight frothing when you do mix up the powder, this is definitely not enough to detract from the overall flavour. Optimum Nutrition&rsquo;s new Gold Standard BCAA Train + Recover is another excellent addition to this premium range and follows hot on the heels of their extremely popular Gold Standard Pre Workout. The new BCAA formula is simple with only 3 active ingredients, but extremely effective at promoting lean muscle growth and enhanced recovery ability. It’s well dosed and tasty with negligible negatives. If you’re after a no frills intra workout or BCAA supplement that gets the job done without any fancy additions, then the Gold Standard BCAA from ON is for you.